They say a picture is worth a thousand words. But in this day and age is a single photo enough to capture something as small as a moment or as vast as an entire war? Perhaps that is all it takes; one look to discard the complexities of a single still image: a child holding a gun, an orphaned Iraqi woman, or a half buried pile of civilian casualties. Presented by Vancouver based company Boca del Lupo, PHOTOG: an Imaginary Look at the Uncompromising Life of Thomas Smith, examines the controversial and provocative worlds of conflict journalism through the fragments of one man’s memory. 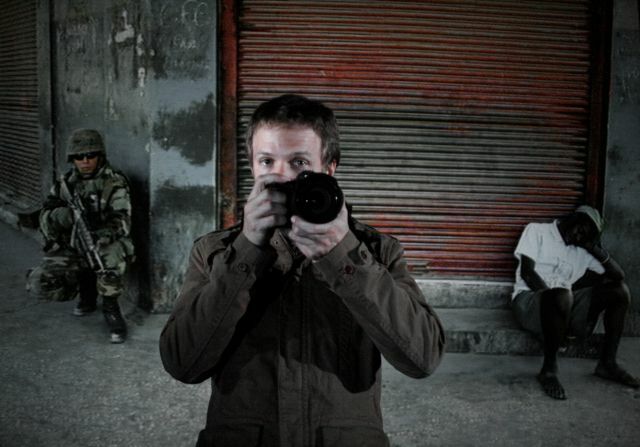 In 2008 co-creator Jay Dodge interviewed four contemporary conflict photographers on camera in New York City. He weaves together their experiences, memories, and photographs into PHOTOG; a challenging piece that asks us to look closer at our complacent attitudes toward war, conflict and poverty. Directed by Sherry Yoon and written and performed by Jay Dodge, this dynamic duo brings enormous spirit and connection to their work as they are also co-creators. In addition, the piece is seamlessly stitched together by a creative team composed of Tara Cheyenne Friedenberg (choreography), John Webber (lighting), Brae Norwiss (video), Carey Dodge (sound), Pietro Amato (composer) and Mara Gottler (costumes), to name a few. Although the main character Thomas Smith (Dodge) is fictional, the stories are true, the text verbatim, and the images are unquestionably real. The piece juxtaposes the extreme landscapes of war with the banal and domestic images of home; the two so at odds with one another they prove impossible to reconcile. With intensely precise and imaginative use of technology, computer animation, dynamic physicality and good ol’ theatrics, the piece is able to examine the juxtaposed contrasts of black and white, war and peace, foreign soil and home turf, privilege and suffering, and togetherness and isolation, resulting in an introspective look at our own lives. Although Dodge’s performance is strong, the emotional arc of his character falls flat. Smith wears an emotionless mask through the piece which mirrors the isolated complacency of his world. However there needs to be moments where the mask dissolves so we can see the man behind the shell and his emotional depths. If Dodge takes an emotional leap and plunges into the deep end to find the stakes, the audience will too. In contrast, the technological integration of the piece is incredibly effective. The use of photography, video, music, animation, and physicality is so seamless it really becomes a character in itself. Amato’s live music composition brings a beautiful layer to the piece and Sean Tyson rigging work adds an explosive physicality. All in all this is a technological masterpiece. My only concern is a few of the video choices, namely the peep-hole characters as seen through the door, which seem too false and contrived in this world of honest story-telling. Yoon’s direction is also inventive and strong. She masterfully balances the complex technical elements with simplicity on stage. The pacing of the piece is well-timed and the transitions smooth as glass. The energy, however, is a little tentative off the top and it isn’t until around the mid-way point that the audience is really sucked into the world. Nevertheless, by the end the stories are engulfing and the images provocative. The final moment of Smith walking down the hall into vastness resembles something like an asylum, mirroring the disturbed nature of his inner turmoil. The end result: a piece that asks us to look deeper at our own lives and the price of our privilege. PHOTOG successfully breaks down society’s disassociation in world affairs, packing an emotional punch stronger than words. Unfortunately even that might not be enough to knock us out of our complacent attitudes. I saw this show last night (Friday, Nov. 20), and left feeling more than mildly perturbed. Despite the multitude of technical bells and whistles, I felt like I was missing any emotional connection to the piece––– that is, up until one of the actual photos appeared on stage. The photographs were vital, and filled with emotion and conflict; which made the glaring lack of those qualities within the actual theatre-piece all the more obvious. Perhaps I was in the mood for a simple, heartfelt story I could connect to; and that was there in the photographs. Those gripping photographs, which had to compete with an emotionally flat (albeit athletic) narrative performance, a repetitive and limp script, music that sounded tinny and reminiscent of an after-school special, and sound that was either obnoxious or underwhelming. The on-stage rigger was, sincerely, the most engaging, communicative performance of the night. The idea of the live performer engaging with multi media in an audio-visual arena can work, and be quite effective when the live and recorded elements in concert with each other lift the material to new heights; Robert Lepage is a virtuoso of this kind of work. PHOTOG, however, fell flat despite all the obvious wires and cables holding it up. To quote the show, "...no matter how hard I tried, I couldn't really feel anything." I went to the performance of Photog last night and can't stop thinking about it. I must start by saying that my brother is a journalist who has been assigned to many wars and conflict zones (Afghanistan, Haiti etc) so the subject felt immediately close to home. The experience: Jay Dodge drew me in immediately. I believed him right away. I warmed up to the technology and ended up loving how it contributed to the piece without being a distraction. While I agree that the piece was a bit flat as far as the structure (story, after story, after story...) and Jay's emotional exploration, I appreciated that it didn't turn into a melodramatic performance. It was after all, a one-man's show of story telling and consequently I heard one man telling stories and that was satisfying. But he wasn't really alone during the play. He spoke to us as if we were in the living room with him. I was there. Because he wasn’t alone he spoke of post-traumatic stress disorder but didn’t act up the symptoms, which was a relief. I enjoy a piece of Theatre that doesn't have to explore every single emotion in human existence to validate acting. I appreciated that the piece focused on the experience of an outsider at war, the definition of normal when living in extreme circumstances, the different challenges that the job presents morally and the contrast of here and there without creating a cliché of politics and violence. Have talked about this with others who went to the show and all agreed that there was an emotional disconnect in the performance and that perhaps Jay Dodge is not the best choice to play the lead role, perhaps too close to the research and writing and it needs someone else to interpret the material in a different way and bring it alive? Similarly, the characters at the peep hole were "characters" - felt too contrived. And although being on the edge, as an audience, between this all being a construct, another story as a vehicle to get at some difficult and interesting emotional and ethical issues, and it being a real story, one person's real journey can be interesting, it creates an audience disconnect if we have to hold the intellectual construct too long and not enter into the piece in compassionate and sympathetic ways. The technology and rigging were wonderful ideas also, as constructs, and they can work and be very powerful. Agreed that the rigger onstage was a wonderful moment of reality, of someone doing their job behind the scenes to allow someone else to bear witness to the main event (see the constructs work, you picked all the right raw materials!). But the rigger is such a refreshing moment of honest reality that one's connection to him/that stands in contrast to the unconnected material in the show up until his moment on stage. The point is, there's a lot of amazing material here, though somewhat repetitive, could be edited a bit more for greater impact. There is a wonderful collaboration here that grew this piece thus far. But if all the material is presented in the same equalized flat way I leave feeling disconnected, like it doesn't matter, when I think the point of the piece is that it does, or confused. Nonetheless, I left with much to ponder and roll around in my head because when we walked out I spent some time looking at those hauntingly aesthetically absolutely beautiful photographs filled with such hard truths on the tables outside. It was they that brought the whole play alive for me and without them a very big piece would have been missing. Sifting through them on the tables was like sifting through so many lives, a memorial, an hommage, a bearing witness, a saving from lost collective memory of the real lives of people we would never know existed, never know were affected by these events, that we would simply never have connected to in any other way. And that is the value of those photographer journalists chasing the shot, putting themselves in harm's way, making difficult ethical choices whether to shoot or reach out and lend a hand - in other words our choices too by proxy. This is where the connection and poignancy lie. I just can't help thinking the play itself should be able to carry more of this, even though I also think the photographs should always be part of the theatre piece whenever it plays. Cheers.